Tonight: Cloudy. Lows around 50 degrees. Monday: Gradual clearing. Cool. Highs in the upper 50s. Tuesday: Sunny. Beautiful. Highs in the mid 60s. Showers will clear out overnight, but clouds will be slow to clear. Overnight low temperatures will drop down to 50 degrees, and Monday will be relatively cool (cooler than average). Clouds will be stubborn along the coast, in fact, it will take most of the day to clear. Tuesday will kick off a fantastic stretch of weather. We run the risk of seeing sea breezes most days, which will keep the coast rather cool. If you live more than a couple of miles inland, it will be quite mild. Temperatures most afternoons will climb into the low 70s. High pressure should guarantee us mostly sunny skies. The next system we are watching is a warm front, which will move in by the end of the week. Our next chance for showers will be Friday. Those showers may linger into the weekend as well. Again, it doesn’t look like we will see a washout any day, but showers could bring your our door plans inside from time to time. Early the following week will bring us a very difficult temperature forecast. There will likely be a large range in temperature. We will be watching a backdoor cold front. 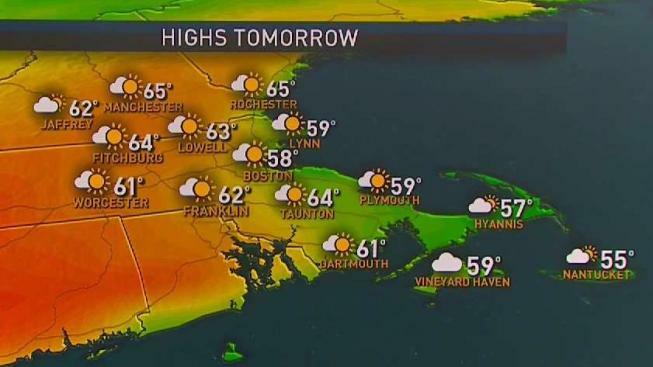 Parts of New England could be stuck in the 40s and 50s, others will back in the 80s. Stay tuned!